This recipe has been freewheelingly adapted from [%bookLink code=0517148293 "The Fannie Farmer Baking Book"], by Marion Cunningham. The steps include directions for using a stand mixer and mixing by hand. With a stand mixer: Stir the flours, sugar, salt, and yeast together in the bowl of a stand mixer. Add the butter and mix with the paddle on low speed until incorporated into the flour. Add the milk and egg and continue mixing with the paddle until the dough comes together in a shaggy ball. Switch to the dough hook and mix on medium speed for about 4 minutes or until the dough is smooth and tacky; it will likely stick to the bottom of the bowl. Transfer the dough to a well-oiled bowl, cover, and let rise 2 hours or until doubled in bulk (see Note). By hand: Cut the butter into the dry ingredients with a pastry blender. Stir in the wet ingredients, and knead on a floured surface until smooth and tacky, about 10 minutes. Transfer the dough to a well-oiled bowl, cover, and let rise 2 hours or until doubled in bulk (see Note). Grease two 9-inch round cake pans. Remove the dough from the bowl to a floured surface and cut it in half. Roll one half into a long cigar shape and cut into 12 equal parts. Roll each piece into a ball and place in one of the greased pans. Repeat with the remaining dough. 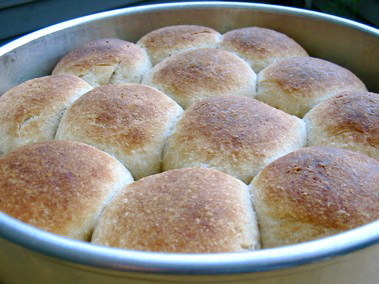 Brush the tops of the dough balls with melted butter. Cover the pans with foil and let rise until the balls grow into each other, 45 minutes to 1 hour. Preheat the oven to 425 degrees. Remove the foil from the pans and bake 15 minutes. Serve immediately. You can get the dough to rise in 45 minutes by putting the bowl in an oven that has been preheated to 200 degrees and then turned off. Tip of the hat to Cook's Illustrated for this. Be sure to check out Matthew Amster-Burton's column on the mysteries of yeast.